Did you know that West Philly is pretty hilly? I try to get us out to run on some of these hills and others are just unavoidable (especially Spruce Hill where we start and end many a run). This week, following a few runner's requests for this sort of run, I've chosen to embrace our frenemy, Spruce Hill and run all over its face. Fishtown Beer Runners Annual Holiday Lights Run. December 13 7pm. This is a great annual tradition, a costume run through South Philly to see all the amazingly overdone lights. 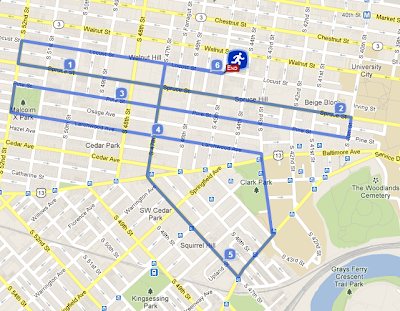 Wear your Santa outfit, lights, and bells and meet down at the Broad Street Line AT&T station (Broad & Oregon). Run ends at Sardine Bar for drinks.